Robertson's Real Beef Jerky is a brand of Robertson's Hams based out of Baird, TX. Robertson's Hams has been around since 1946, focusing on ham, bacon, and sausage. But they've developed quite a reputation for their beef jerky. Since the 1950s they made a practice of advertising their smoked meats on highway billboards, and once the Interstate system came around in the 1960s, it sent Robertson's business skyrocketing. Today, they operate six stores throughout Texas and Oklahoma, and offer a wide variety of foods. One of their stores in Salado, TX offers another brand called "Choppin' Block", which I'll review later. Robertson's claims they source their beef from Kansas and Texas. Beef, water, salt, sugar, spices, sodium nitrite. The first thing I taste from the surface of these pieces is a faint saltiness, and a light fatty flavor. Overall, the surface flavor is very light. In the chewing, the first thing I taste is a slight bit more saltiness, and a slight natural meat flavor. Overall, it's a very light tasting jerky. For being billed as a hickory smoked variety, it's only a light tasting smokiness. Some pieces are extremely light in smokiness, while others are just light. Overall, I still expected to get more smokiness, consider "hickory smoked" are the only words Robertson's uses to describe this jerky. I think the primary flavor of this jerky is the natural meat flavors, but it's a very light flavor. It's light enough that I wouldn't call it a dominant flavor, but it's really the most significant flavor I can taste. There's a fatty flavor mixed into it, evidenced by the heavy marbilization of this meat. The smokiness goes into that meat flavor. The ingredients list mentioned "spices", but thus far all I can notice is a light saltiness, and light black pepper flavor. The salt intensity varies from piece to piece, I had a couple with a very light saltiness, and another just being light. The same with the black pepper, very light in some, and just light in others. But after eating several pieces, the black pepper builds up a medium intensity aftertaste. Overall, what you're going to taste in this is a very light natural meat flavor, with a fatty flavor, a light smokiness, a light saltiness, and a light black pepper. It's just a light tasting jerky. These appear to be slices of whole meat, sliced thin, and in large pieces. 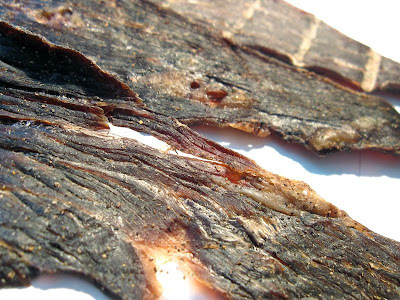 This is a dry jerky, one that's actually crispy and crunchy due to being sliced thin. Tearing pieces apart with my fingers seems easy to do, mostly by bending and breaking a chunk off. Chewing seems easy as well. The chewing texture starts off feeling dry and woody, but crispy and crunchy. They chew down easily enough, with very little effort. Once it gets down to a soft mass, it feels pretty much like a steak cooked well-done, kinda dry and very fibrous. These pieces have a lot of fat marbilization which adds to the flavor, but I also found a few pieces with significant chunks of fat hanging off. But I didn't find any gristle or tendon, and little in the way of stringy sinews. The covering of finely ground pepper tends to pick up on my fingertips, along with a light coating of oil from the surface of these pieces. Tearing a piece apart also causes some black pepper and tiny meat fragments ot fly off. 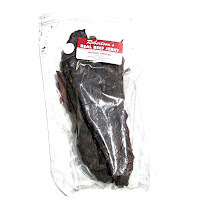 Robertson's sells this Hickory Smoked variety at a price of $12.95 for an 8oz package. I bought three packages, each a different variety. Add to that shipping costs of $11.50, and the total came to $50.35. That works out to a per ounce price of $2.10. For general jerky snacking purposes, at the $2.10 price per ounce, this jerky seems to provide a fair value. I'm getting a decent amount of snackability, mostly for its meat consistency and steak-like chewing texture, and less for its light flavor. the $2.10 price per ounce is on the high side, but the thinly sliced crunchiness makes for some fun snacking I think. As a hickory smoked variety, at the same $2.10 price per ounce, it's a weak value. I don't really get much smoky flavor from this. Some pieces have some light smokiness, while others just don't seem to have any. Considering Robertson's advertises this as a hickory smoked variety, I expected to get more smoky flavor for my dollar. This Hickory Smoked variety from Robertson's Real Beef Jerky gives me a decent amout of snackability, mostly because of its thinly sliced, crunchy texture. I think it creates some snacking pleasure hearing the crunchy meat, but then evolving into a good, steak-like chewing. As far as flavor goes, it's pretty light overall. Just a light meat flavor with some fatty taste mixed in. A light saltiness, and a light black pepper. The flavor actually doesn't impress me, it's a pretty simple flavor. Though, it's not a bad flavor. It just doesn't interest me much. It's mostly the meat consistency that provides the snackability here. But I think this does have a nice "homemade" quality to it, in both the flavor and meat consistency, that does seem to hold up to the "real beef jerky" name. For recommended beer pairing, I'd go with a simple brown ale. As truck driver who as traveled far and wide in search of great beef jerky, I vote this one as the best. I can no longer eat soft beef jerky after eating this stuff.love it. this is old world style jerky. the meat has great flavor, and a single piece can be chewed for a long time. you can also find this stuff at any love's truck stop too. TRY IT! I love Robertson's Jerky....but it's getting too expensive. I usually buy ~20lbs at christmas to give out. But that will now run me ~$425! I wish I could find a good (less expensive) Robertson's Jerky substitute! I got some of this today and whilke at first I was not impressed but after awhile I realized that this jerky grew on me and on second thought was very likeable. I haven't had Robertson's Real Beef Jerky per se but I have had Love's Beef Jerky (made by Robertsons). Does anyone have an idea of how to make beef jerky like this at home? My favorite jerky and I have yet to find an equal of even similar substitute. My family and I have been eating their beef jerky for nearly 40 years. That's right! This is by far the best we have ever eaten. best beef jerky on the market. Sorry, but I have been eating Jerky for 40 years. Robertson's is in the bottom quarter of the bottom quarter. I think it's terrible. It is so dry it was like eating a cracker. But that is not all that bad IF it had great flavor. It did not. I could not taste smoke flavor and I could not smell smoke flavor either. The taste was bland and smell was an appetite killer. The store even had a section for your dog. Not made for dogs, but old. Yes, I mean that. How can you not sell jerky before the shelf life is gone??? I could see mold on the dog version. Speaking of dogs, my wife made me toss it out of the car. She claimed it smelled like dog food or dog treats. I didn't tell her, but I thought the same thing. I hate to drop this one on the lovers, but it simply is horrible jerky. I don't want to name my preferred jerky because I don't want anyone to think my bad review is biased or submitted by a competitor. Oh, and it is among the most expensive I have ever bought. I bought 1/2 pound and some beef sticks. Spent over 22 bucks. I believe it was 32.00 a pound. I like Robertsons jerky but I agree it is a bit pricy. As mentioned above I don't care for soft beef jerky, I like mine kinda dry and stringy. Robertsons definally has a lot of "chew" to it tho, as after my first day of eating it my jaw was sore from working it, lol. I would love to hear for other users where to find a similar jerky.